A shared account is a method of automatically distributing funds among all campaigns that are under the same username. Your ads will continue being served until your shared account runs out of funds. To go to the Shared account page, click the button at the top of the page that displays the amount on your shared account. To add funds to your shared account, go to the Shared account page and click Pay. The payment options available differ based on your country and currency. You can set an average daily budget limit for a shared account. On the Shared account page, go to the Average daily budget section and click Configure. Specify the average daily spending per week. The budget will be distributed across the entire day or time period you entered in your time targeting settings. If the budget you set is not sufficient to serve your ads throughout the whole day, your ads will participate less frequently in the auction. If the specified budget is enough to serve ads all day, you will receive all available traffic. The budget is reallocated over the course of the week: your remaining balance from less active days will be spent during more active days. This means that your daily spending may be higher or lower than the the value you set. Any individual day's spending will not exceed the average daily budget amount by more than 30%. Your average daily spending over a week will not exceed your limit. 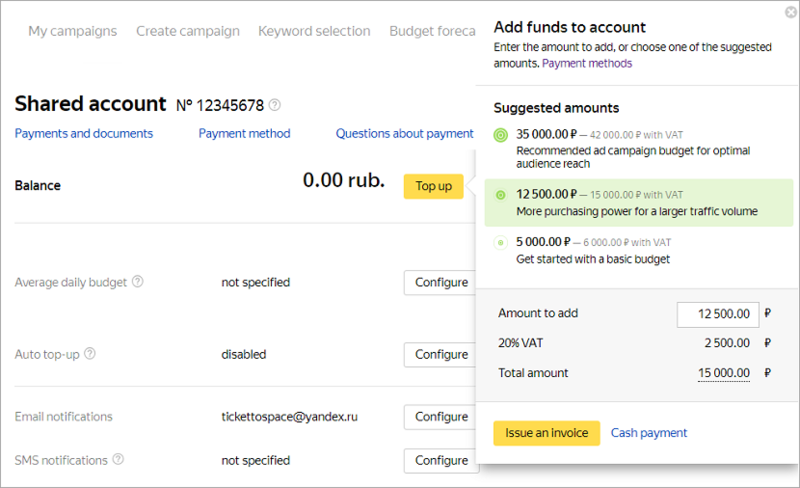 If you use common keywords with a small daily budget or set high bids for keywords, Yandex.Direct can not guarantee that the system will distribute impressions evenly throughout the day. Your available budget may run out completely at the beginning of the impression period, with no funds left for the rest of the day. Your daily shared account budget works together with your campaign budget limits (daily or weekly budget). For example, let's say that you have two campaigns with average daily budgets of 500 RUB and 3000 RUB. If you set a shared account daily budget of 1000 RUB, then on both campaigns the average total of 1000 RUB per day will be spent, while on the first campaign 500 RUB per day will be spent. Click Recent campaign suspensions to see every instance when the system stopped serving ads over the past 14 days due to your daily budget. You can't change your average daily budget more than three times per day. The minimum budget is 1000 rubles per day (see other currencies). Your daily shared account budget runs on Moscow time (UTC+3), regardless of the time zone chosen for your campaign. If you disabled impressions on certain days and your campaign runs in a different time zone, you may end up spending more than your budget. For example, let's say you disabled impressions on Sunday in your time settings and set the “MSK +04:00” time zone for Novosibirsk. At 20:01 on Sunday (Moscow time), it will already be Monday in the Novosibirsk time zone, and the system will start serving ads. As a result, part of Monday's daily budget will be spent for 4 hours of Sunday according to Moscow time. Then the system will continue serving ads, and the daily budget for Monday will also be spent.